I'm being upgraded on Friday. The letter from BT says that 'the engineer will install a CD with BT's latest software etc etc. including desktop help'. Now I remember way back having to uninstall this stuff when I'd used the CD (before I knew any better). I'm going to tell the engineer to set me up with the connection and then I'll connect by Ethernet. I have a feeling he's going to say that he has to put the CD on my system, so can forum members (and BT Care if they're here) reassure me that there is absolutely no need to install anything on the computer to get an Infinity upgrade. I might try the wireless at some stage, but I reckon I can do that easily myself. 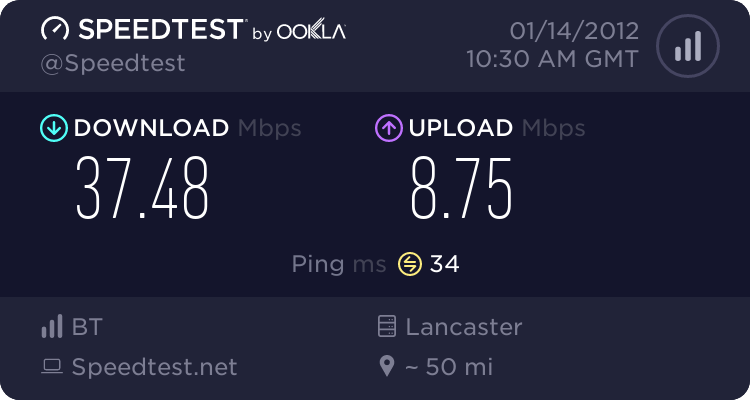 The Broadband Help that I had last time slowed then crashed my computer at frequent intervals. I had Infinity installed here last year. All the engineer did was change the master socket, install a data extension, the Openreach modem, connected the HomeHub 3 to it and then let me connect to the HomeHub from my computer. He didn't install any software but that might have been because I have a Mac. Yes, it says that they don't touch Macs as the software isn't compatible. I think that the CD just loads their Broadband Help desktop and isn't needed for the actual connection. I know that this stuff can occasionally solve issues, but the phrase in the booklet ' this constantly monitors your connection....' is what fills me with dread. Constant monitoring = computer slowing down and freezing occasionally in my opinion. Just look at the effect that some AV and firewall programmes have if not set up properly. Tell him it's a work laptop and you're not allowed to install additional software. Or just refuse, it's your laptop. I dont think the Engineer will be under any obligation to install the software. They didnt ask me about it when mine was installed. Just had Infinity installed this week,OR bloke never asked for it (it comes in the box with the HomeHub)I opened the box and gave him the hub that's all he wanted. As you remember, ISP CDs are never needed and usually a pain. You might even catch one of the nastiest malwares there is from it. It's called McAfee. The engineers are supposed to load the install CD on BT Broadband installs, I have yet to meet one who does. I attempted it on a punters alppy as they had never had web access before, it's a pain. It is more than likely that they won't even offer, if they do, just decline. I caught McAffee many years ago - it's not that bad, is it? It has zapped a few nasties and warned me several times about risky activity. Mcafee and Norton are the two most worst bits of software you can install on a home computer.